Coming from a family with long tradition in practicing crafts, embroidery being one of them, I developed love for this unique language that was created with a needle and thread. 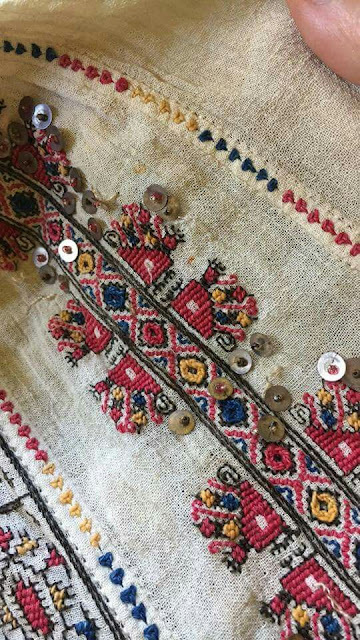 Being a proud owner of a Romanian blouse, I was intrigued by the intricate patterns they used to decorate their blouses. 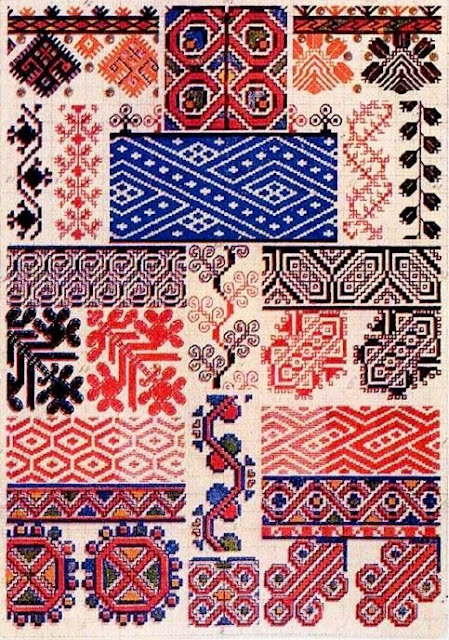 The Romanian blouse, also known as Ia, is quite unique in its structure and distribution of the ornamental panel(s) in the center of the blouse and on the sleeves. The blouse is big and roomy with voluminous sleeves that actually indicate the wealth of the family - the puffier the sleeves, the wealthier the family. The color palette is usually entirely monochromatic, defined as "chromatic sobriety". The Ia contains secret carefully chosen symbols, each to communicate and convey feelings and emotions, a message or a story. It is a kind of a "manuscript" that tells the story of predecessors and links the past with the now. The peasant Romanian woman embroidered her clothes with her soul. The embroidery showed her prayer to God: "Inspirit my clothes, the secret of my soul". All the symbols and geographic shapes stitched onto the blouse aimed to generate and direct the energy they represent. The embroidery work on the chest and the sleeves channel the energy through the body, down the arms into the hands. They used protective symbols to shield them from evil (the rooster and the eye), cosmic symbols and ascension (the stars, the sun), fertility and abundance (snail, wheat, leaves and fruit), symbols of time passing, rebirth and eternal life (grapevine, stream of water). By being able to read the needlework one can decipher a message from people that lived long ago and see what they feared, loved,lived and wished for. My blouse is similar to the blue one below and you can read about it here. Did you know there was an international Day of the Romanian Blouse? Sources I used to write this post include Folkwear Society, Romania's Secret Language, Romania:Beyond the story of a secret language. I used to have a blouse like this - mine was red on white - and I never new that the stitches had meaning. I wish I'd looked closer. This was fascinating, Maya. Thank you. Thank you Maya. As I´m romanian is a pleasure to see our tradition is apreciated. Nice post. Thank you Alina! It was a real pleasure! 40 years ago my parents visited Romania and they brought back a few of these blouses for themselves and their 3 children. I wore them for years and I really really loved them!Because I was the eldest, my younger brothers wore them when I grew out of them. I stil have some pictures of us wearing those beautiful blouses. Thanks for reminding me of them! Maya, thank you for this post! 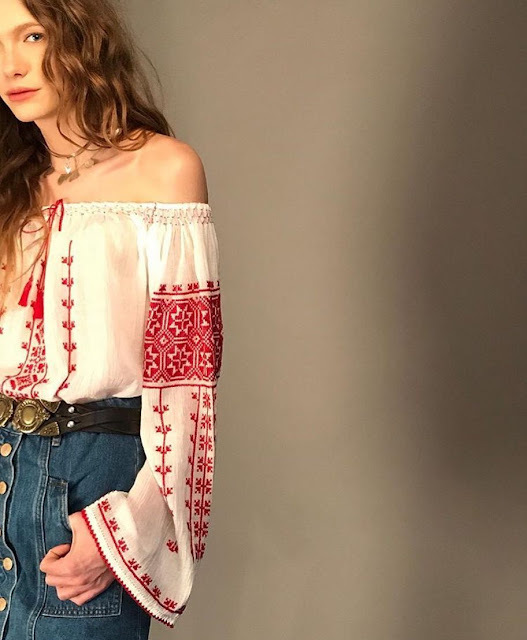 I'm a Romanian woman and I am amazed that other people like this blouse. It is a beautiful one, indeed, and full of symbols, but I thought it is precious for Romanians only. Beautiful embroidery. The meaning of the patterns is very interesting. Happy November, my friend. I am so glad this post brought beautiful memories! Do you still have any of those blouses? Cristina, isn't it wonderful how certain notions, symbols and meanings transcend through space and time and bind people together. 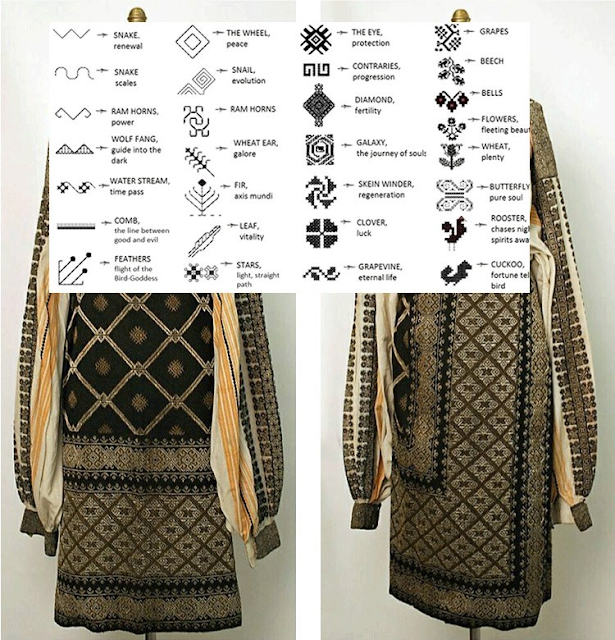 Being "close" in teritory I found many similar symbols and meanings with the stitches on folk costumes of my people. Isn't that amazing?! You must be proud with this kind of heritage and we all get to enjoy it along with you! Thank you dear Mia! Happy November too! Now that is interesting! I didn't know that! I like the embroidery but now I know it has a meaning, I like it even more! Such lovely embroidery and the meaning. I think we should have an embroidery of the world unite. Each country has it's traditions of embroidery and they are so special to share and inspire. Thank you for sharing with us. That's so interesting, I thought they were just really pretty. How wonderful to sew your soul into a garment. No, I did not know there is a special day for the Romanian Blouse; how fabulous. I was thoroughly intrigued with the stories, symbols and hidden codes and meanings behind these gorgeous embroideries. 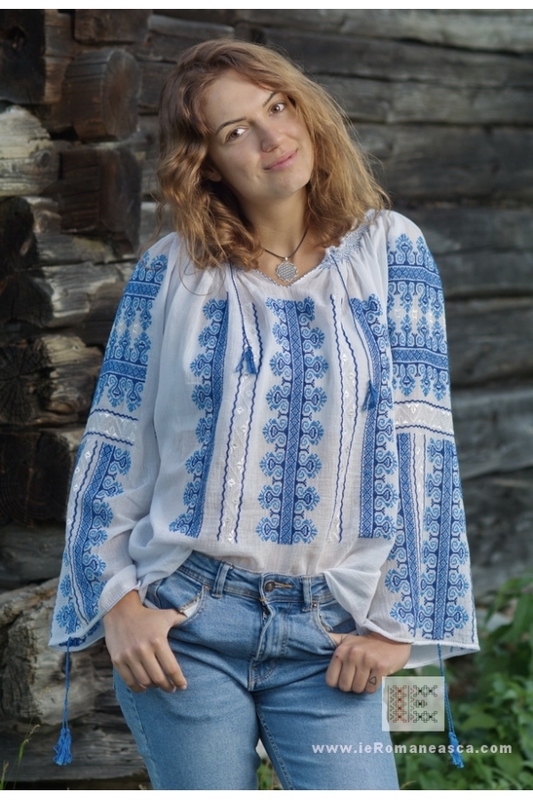 Each and every blouse is a visual treat and as for your blue beauty, Maya, just gorgeous. You must feel like a Romanian princess when wearing this pretty. I found this absolutely fascinating! I had no idea that there was so much significance to the embroidery on these beautiful blouses. Thank you so much for sharing this post with the Hearth and Soul Link Party. Sharing on the H&S Facebook page. Hope to see you at the party again this week!